The government’s £20 billion economic stimulus is a desperate attempt to stop a riptide of red ink feeding into deflation. Yet already it is hard to see how Gordon Brown’s fiscal package can make much difference in the face of a deep recession. Such at least is the view of our biggest retailers, according to Robert Peston. They’re right. A temporary 2.5% drop in VAT is irrelevant when high street prices are being cut by 20%. The general public are also unlikely to go out spending when they are already aware of the inevitability of future tax rises, as they and the next generation work to pay the bill. And it’s far from clear who precisely Mr Brown expects to go out and spend. The very rich may not notice, those in the middle are likely to repay personal debt instead, and the least well-off already need to spend every penny they have. is in the grip of an outdated 1970s textbook conception of economics. micro-management seem not merely legitimate, but positively required. belief in unfettered financial markets. repossessions may well hurt, not help, economic recovery. 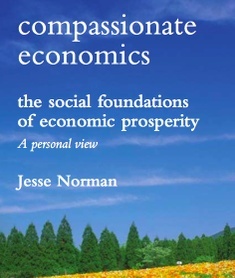 Compassionate Economics by Jesse Norman is published today by Policy Exchange and the University of Buckingham Press. The book is launched tonight at Policy Exchange, Clutha House, 10 Storey’s Gate, Westminster at 6pm with speakers John Redwood MP, Jon Cruddas MP and Prof Julian LeGrand of the LSE.